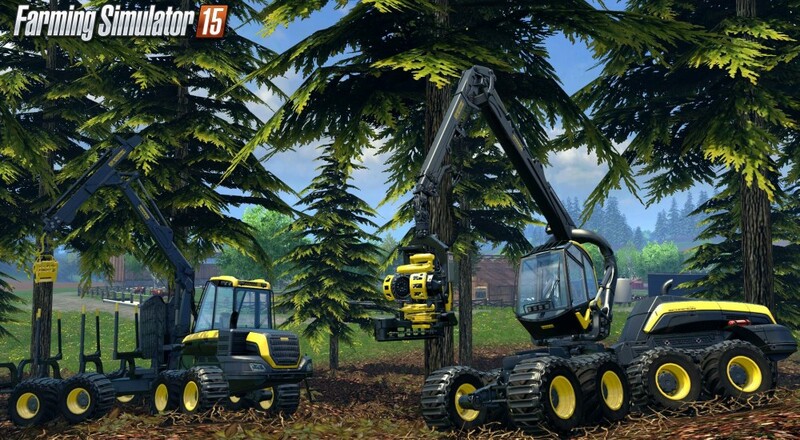 I've got a brand new Farming Simulator 15 trailer and you have a brand new key. Let's put them both together in perfect harmony. Out already on PC, Farm Sim 15 is coming to consoles on May 19th; harvest-tastic. If you own a PlayStation 4, PlayStation 3, Xbox One or Xbox 360, prepare to have your game collection completed as the premium console farming sim is coming to all these devices. The online co-op will only be available on the newer generation consoles; the PS3 and 360 just cannot handle this many polygons at once. With a brand new graphics and physics engine, Farming Simulator 15 offers an immense open world filled with details and visual effects! In solo, but also for the first time online on consoles with the PlayStation 4 and the Xbox One, manage and develop your own farm: harvesting, animal husbandry (cows, chicken and sheep), sales of fresh products, investment in new and more powerful vehicles or tools… Discover also the new activity in Farming Simulator 15: woodcutting, and its selection of entirely dedicated vehicles and tools! Page created in 0.3574 seconds.